Spring is in the air and this Lemon Pie is so easy, you have no excuse other than to make it and enjoy a slice of this flavorful and delectable pie. It's 3/14 and National Pi Day! 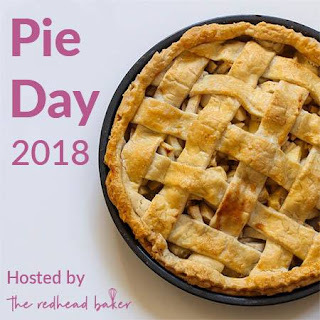 Now Pi Day isn't only a special holiday celebrated by math enthusiasts, it's also a great excuse to eat one of my favorite desserts - pie! I just love making and eating pie! I don't know what it is about pie. Maybe it's because pies always look so pretty, or maybe it's because they always make me feel special, or maybe it's because they simply taste good. Whatever the case maybe, you can't go wrong having a slice! When thinking about what pie to create for Pi Day this year I was inspired by the sunshine we've been having lately, Easter around the corner, and my Mother-in-Law. My Mother-in-Law is a delicious cook and baker, and while many know her for her perfect scotcheroos, another one of her desserts she loves to share in the spring is her lemon dessert. The lemon dessert is made in a 9 x 13 pan and is layered with a simple crust, cream cheese layer, lemon layer and then whipped topping on top. The flavors are delicious and you can't help but smile when you eat it, so I wanted to transform her dessert into a pie! I decided to start the pie with a graham cracker crust. I felt like the slightly sweet crust was a great foundation to top with the sweet and zesty layers. After the crust is baked let it cool and add the cream cheese layer. I think this is the key layer of the pie that just takes it over the top. This layer is a great compliment to the lemon and is sweet and rich. The final lemon layer is what makes you feel like it's spring or summer. The pudding top has the tartness your looking for from the lemon, yet is mellow, so all ages can and will enjoy it! Mix melted butter, graham cracker crumbs and sugar together and press into a 9" pie plate. Bake the crust at 375° F for 7 minutes and then cool. After the crust has cooled, cream together the cream cheese and powdered sugar. Then stir in the whipped topping. Spread the layer on the bottom of the pie crust. Beat together the lemon pudding and milk with a whisk and pour over the cream cheese layer. Chill the pie thoroughly in the refrigerator before serving. Serve with a dollop of whipped cream on top of each slice! Agree, this looks so pretty. And I'm a big lemon fan. Thanks Caroline! I love lemon this time of year! Buried in snow as we are, lemon pie sounds like just the thing to boost up our spirits! Our snow is starting to melt and lemon sounded like the perfect way to welcome in spring! Oh, boy, this is one spectacular pie! Perfect for Easter (and Pi Day, of course!). Pi Day for the win! This will be good for so many occasions... I love how pretty it is too! Thanks Michele! I have to agree - Pi Day has been awesome! No problem! If you would send me an email at vplagge@gmail.com I will send you the 9x13 recipe! SO pretty and, I'm sure, tasty! Can't wait to try this, Val. This looks so easy peasy, and I'm sure it's delicious. It's a simple pie that the whole family will enjoy! That pie looks amazing! I love the layers and lemon is definitely the bright fun flavor we need as we try to kick winter out the door! Lemon is one of my favorite flavors. Your pie is magnificent! I am pinning to make for the family. We are going to enjoy this one! Thank you Eileen! Hope you enjoy it! Lemon always make me think of Spring too. Your pie looks lovely. It's beautiful recipes like this that make me miss my lemon tree. Definitely making a grocery list. Thanks Ellen. Hope you enjoy the pie! Lemon is always perfect for spring - love this! Thanks Kate - I couldn't agree more. Oh, I do love lemon pie! I need to make one again! Yum! I love lemon anything and any simple recipe is right up my ally! 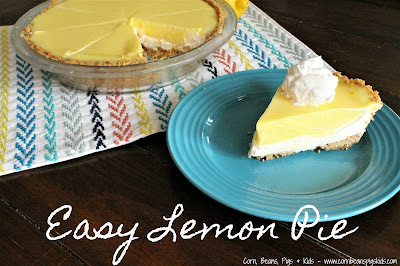 Lemon is one of my favorite pies! Yes please! I hope you try out my recipe then! It is a winner with our family! Any pie involving cream cheese is a winner right off the bat in my mind. And this looks perfect! Oh yes...lemon pie has always been my favorite! You'll have to try this recipe then. It has become one of our family's favorites.